Lack of winter rain affected both vines and cover crops, limiting available nutrients. Still, the vines carried a decent-size crop, which ripened in September. Fermentations progressed slowly; extraction was decided by careful tasting. Malolactics started in tank, and finished by February. Merlot, which suffered in 2013, was strong in 2014. Petit verdot remained challenged by drought. This elegant vintage shows intense fruit, limestone earth, and firm acid. Rainfall: 11.8 inches (40% of normal) Bloom: Mid-May Weather: Very dry December & January; most of the rain fell February through April. Overall above average temperatures at Monte Bello. Fermentation: Grapes destemmed, 100% whole berries. Automated berry sorting followed by hand sorting. Fermented on the native yeasts. Pressed at ten days. Natural malolactic. Sustainably farmed, hand-harvested, estate-grown grapes; destemmed and sorted; fermented on the native yeasts; full malolactic on the naturally occurring bacteria; 0.29 g/L calcium carbonate added to moderate the high natural acidity in ten of the twentyone parcels; 2.2% water addition to six of twenty-one lots during fermentation; oak from barrel aging; minimum effective sulfur 25 ppm at crush, 109 ppm during aging; pad filtered at bottling. 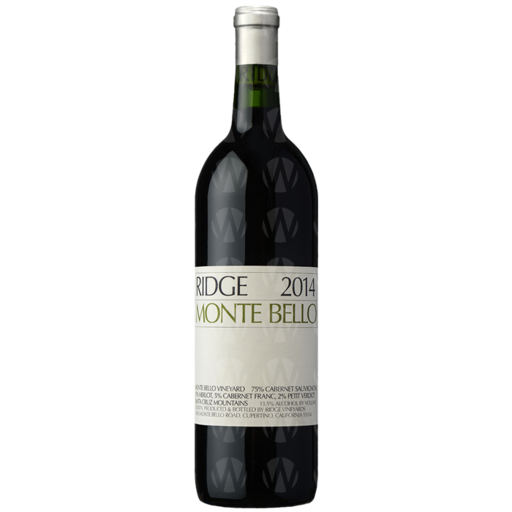 Intense blackberry fruit aromas, blackcurrant, exotic barrel spice, toasted oak, licorice, and complex forest notes. Rich mountain fruit entry, refreshing high acid, full chalky tannin structure, and sweet oak; strong mineral finish.